The VESDA VLP by Xtralis is the flagship of the VESDA aspirating smoke detector product line. Using unique detection principles, the VLP has an alarm sensitivity range of 0.005%–20% obscuration/m (0.0015%–6.25% obscuration/ft). The detector can form part of a modular system with the display, programmer and VESDAnet modules installed in a remote location or as a "self-contained" system by replacing the detector's panels with display and/or programmer modules. With the display and programmer remote, the user interfaces for many Xtralis VESDA VLP detectors can be grouped together in a cabinet for easy programming. Air is drawn into the VLP through a network of air sampling pipes by a high efficiency aspirator. Each inlet pipe has an airflow sensor that monitors airflow changes in the pipes. Air is exhausted from the VLP and may be vented back into the protected zone. Inside the VLP, a sample of air is passed into the laser detection chamber. Ultra-fine air filtration provides very clean air to protect the optical surfaces inside the detector from contamination. The detection chamber uses a stable Class 1 laser light source and carefully positioned sensors to achieve the optimum response to a vast range of smoke types. 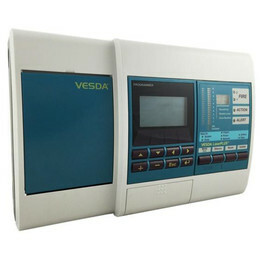 The status of the detector, and all alarm, service and fault events, are transmitted to displays and external systems via VESDAnet. 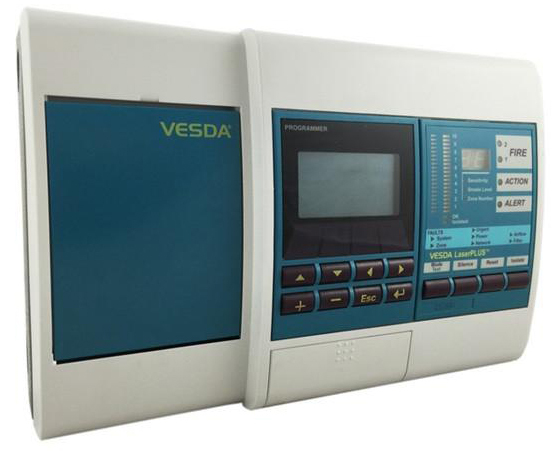 VESDA detectors and devices communicate across VESDAnet, the VESDA fault- tolerant communications protocol. The VESDAnet loop provides a robust bi-directional communication network between devices, even allowing continued operation during single point wiring failures. It also allows for system programming from a single location and forms the basis of the modular nature of the VESDA system. The VLP technology employs unique software tools to ensure optimum operation in many differing environments. AutoLearn monitors the ambient environment and sets the most appropriate alarm thresholds (Alert, Action, Fire1, Fire2) during the commissioning process to allow the earliest possible warning of a potential fire situation with reduced nuisance alarms. Environments that employ air handling systems may be affected by pollution external to the controlled environment when “fresh air make up” is added. Referencing by the VLP ensures that external pollution does not interfere with the true smoke level being detected in the protected environment. The system can safely compensate for this transient state and allow continued operation free from such nuisance alarms. Airflow supervisor per sampling pipe. Clean air barrier optics protection. Easy to replace air filter. Minimum Flow Per Pipe : 15 liters/min. AutoLearn : Minimum 15 minutes, maximum 15 days. Recommended minimum period 1 day. During AutoLearn thresholds are NOT changed from pre-set values. Event reporting via VESDAnet or Event Log.